I suffer from occasional bouts of insomnia. Sometimes it’s because I have a lot on my mind, and sometimes it’s because R is snoring (sorry dude! 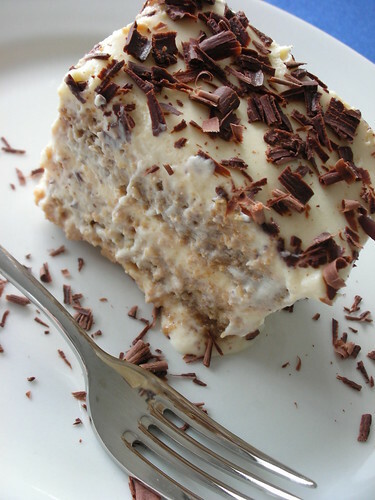 ), but I couldn’t help wondering whether last night’s restlessness was caused by the tiramisu I had for dessert. I hope not, because I’m having it again tonight… but it does mean “pick me up,” right? My Asian bakery tiramsu face-off earlier this month, along with a pot of mascarpone I’d bought on a recent trip to Haberfield’s Ramsay Street, got me craving my favorite tiramisu–mine! I must admit, since no baking is involved I usually kind of wing the measurements. This time, though, I did things with a little more precision and jotted down notes. Since it’s just the two of us, I normally assemble this in a loaf pan. This gives us dessert for a couple of nights, and then it’s on to something else. Just double the recipe if you want to make a larger size. Also, I like mine with lots of boozy sponge so I use three layers of ladyfinger biscuits, but if you like it more on the creamy side, use 2/3 the number of biscuits for two layers and keep the measurements for the mascarpone mixture the same. One last thing…it tastes so much better if it’s refrigerated overnight! – In a bowl set over a waterbath, make a zabaglione with the egg yolks, 1/4 c sugar and 1/4 c marsala. Once it has doubled in volume, set it aside to let it cool off slightly while you whip the cream to soft peaks in a chilled bowl. Fold the whipped cream and mascarpone together, then fold in the zabaglione. – Combine the warm coffee, rum, 1 T marsala, vanilla and 2 t sugar in a shallow bowl. Quickly dip one ladyfinger at a time into the mixture and arrange in a single layer on the bottom of a loaf pan. Top with 1/3 of the mascarpone mixture and grate a little chocolate on top. Repeat two more times, putting a good amount of grated chocolate on the top layer. – Cover lightly with plastic wrap and refrigerate overnight (or at least for a few hours). 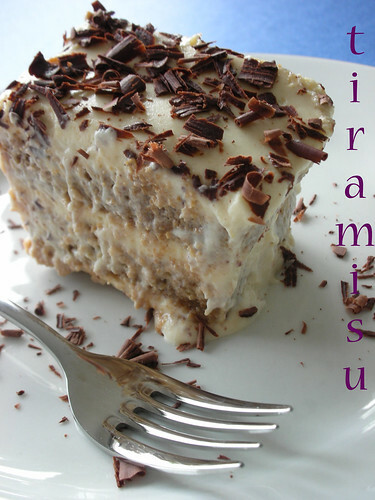 Hi there, very interested in making your Tiramisu however could you tell me if t is a teaspoon or table spoon? Marion, I use a capital t (T) for a tablespoon and a lower case t (t) for a teaspoon. Thanks for your question!